University of New Brunswick postdoctoral fellow Shabnam Jabari is developing technology that promises to be a game-changer for government, aid organizations and first responders around the world. During Dr. Jabari’s senior year of undergraduate study at University of Tehran, a disastrous earthquake struck the southern Iranian city of Bam. The 6.6-magnitude quake in 2003 destroyed homes and killed tens of thousands of people, including the family member of a friend. 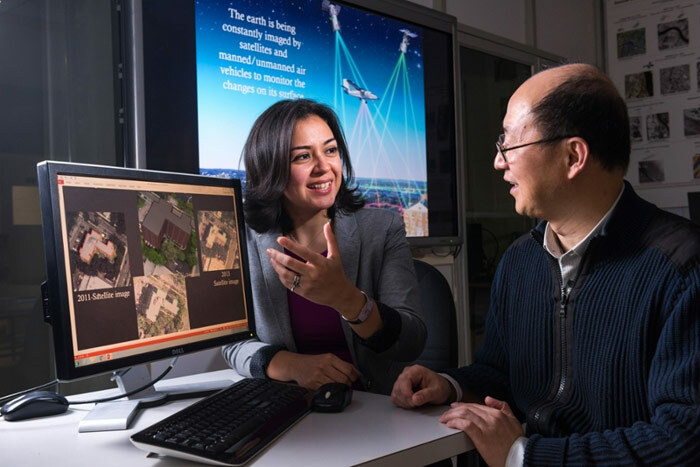 Inspired to make a difference in the face of tragedy, she began exploring how satellite images could be used to detect regions affected by earthquakes. The research she completed for her master’s thesis focused on identifying areas that required restoration in Bam, a world heritage site. Previous technology required aerial photography and satellite images to be reviewed manually, scanning for changes between images, and automatic scans were limited to imagery capture from the same viewpoint, essentially lowering the level of accuracy. Dr. Jabari’s technology automatically scans satellite images from different vantage points to detect changes to buildings, city landscapes and rural areas, providing a much higher level of accuracy. For example, if relief workers in Toronto were looking to assess damage throughout the city after a natural disaster, it could take 50 people more than a month to manually complete the task. With automated change detection software, it would take one computer a few days – and multiple computers only a few hours. The capabilities of this software reach beyond disaster relief to use by government, law enforcement, insurers, city planners – allowing them to detect changes in areas relevant to them and do so faster, cheaper and with greater accuracy. While software currently on the market can detect changes with an accuracy rate of 10 to 70 per cent, the accuracy of this new technology is 80 to 90 per cent. Dr. Jabari came to UNB in 2011 to complete her PhD with internationally renowned remote sensing professor Yun Zhang. Though the research phase is complete, there’s not slowing down in sight. The next step for Dr. Jabari is to develop the software for commercial use. She has a patent pending and has had two papers published this year, with one currently in press and another in progress that she hopes will be published in 2017.